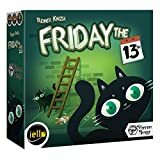 In Friday the 13th, also available over the years as Poison and Baker's Dozen, players try to avoid bad luck by not taking cards from the central playing area each round. The more you take, the worse your score - unless you manage to take the most of one suit, in which case you get to throw those cards away! In a round, each player gets a hand of cards, with the cards coming in three suits that have values from 1 to 7 and a fourth "joker" suit in which all the cards have a value of 4. On a turn, a player discards a card from her hand onto a pile of the appropriate color (with jokers being playable on any pile) and gives the sum of all cards now in that pile. If the sum is higher than 13, then the player must first take all of the cards already in the pile, leaving only her card behind. The round ends once all the cards have been played, then players compare how many cards they have in each of the three suits; whoever has the most cards throws them away, while everyone else scores 1 penalty point per card. Each joker is worth 2 penalty points. Whoever has the fewest penalty points after each player has started a round once wins! 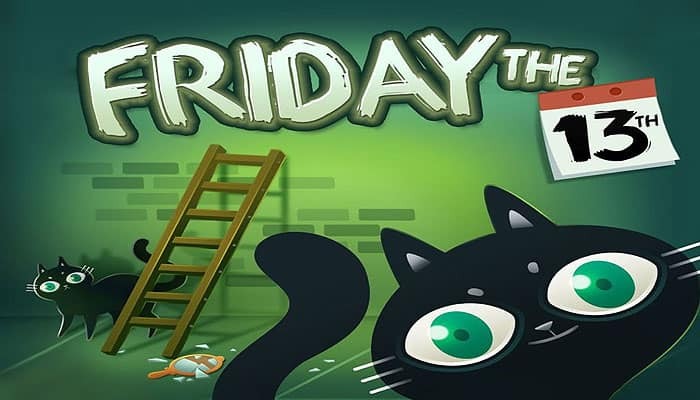 You are all very superstitious people, afraid of the omens of bad luck: black cats, broken mirrors , walking under ladders and, worst of all, Friday the 13th! It is up to you to play your cards wisely to avoid getting too much bad luck. To have the lowest bad luck score at the end of the game. You score points at the end of each round. The game lasts 4 rounds.